in Kürze! At Thursday evening’s United States Equestrian Federation’s annual Pegasus Awards gala, Chester Weber was awarded for the fourth time with the Becky Grand Hart Trophy. The award is presented to the best competitor of any horse or pony breed in international driving, endurance, reining, vaulting or para-equestrian competitions. Weber was previously awarded this honour in 2008, 2011, and 2013. After a stellar year of competitions and making history to help bring home the team gold medal at the World Equestrian Games in Tryon and individual silver medal, the honour is well deserving to Weber and his team for their outstanding work! “I would like to propose a question to all the show jumpers and dressage riders in the audience. Could you imagine having to pass four horses through the FEI jog and have them all ready to perform their best in the Grand Prix ring at the same time? 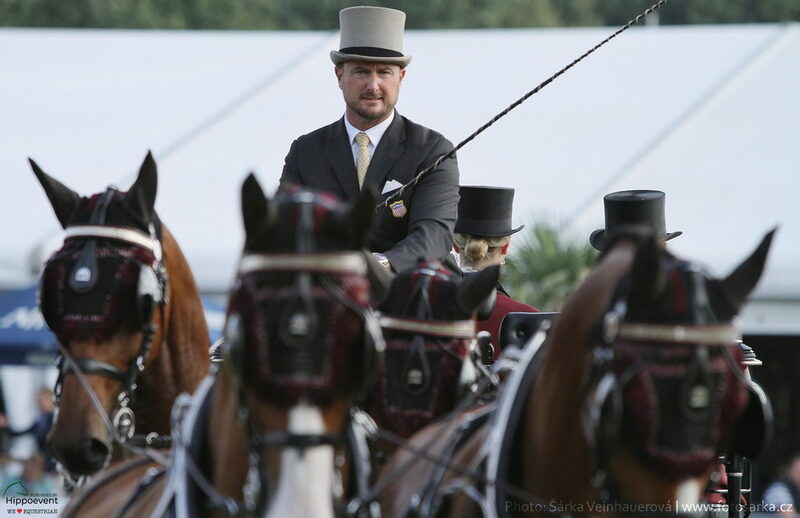 What makes four-in-hand combined driving truly special and unique from other equestrian disciplines such as dressage or showjumping is that while those disciplines may have a barn full of horses which they have to create bonds and work together with, drivers have to work with four horse at once just to step inside the arena. Sixteen legs, eight ears, eight sets of reins, and four hearts which all require the absolute best care and attention to be the best athletes they can be. Without my amazing team of trainers, grooms, vets, farriers, sponsors, and family none of our success would be possible. Jane, thank you for supporting me all these years and being my partner as we climbed to the top of the sport.